For many nest-box monitors, the anticipation of seeing bluebirds, chickadees, and Tree Swallows settle in their nest boxes each year is tempered only by the dread of finding a House Sparrow instead. House Sparrows can be the ultimate adversary for many nest-box monitors, evoking intense emotion and frustration. What is it about this small brown bird that can infuriate staunch bird lovers? 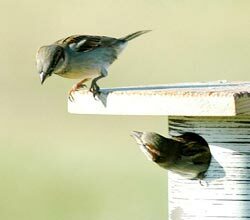 House Sparrows (above) cause problems when they take over nest boxes and evict native birds. House Sparrows are an exotic species, introduced to North America in the mid-19th century. They thrive across the United States and Canada near human habitation or areas with reliable food sources. Visit any mall in America and you will probably see House Sparrow nests in the signage of storefronts, in street light fixtures, and under roof eaves and awnings. The problem for nest-box monitors—and native birds—is that House Sparrows also breed in nest boxes, and their small 61/4-inch frame can easily fit inside a box intended for native songbirds. Male House Sparrows that defend territories early in the season often prevent later-arriving migratory species from nesting. They aggressively defend nest boxes, sometimes evicting other species that attempt to nest in their territory, destroying eggs, killing nestlings, or killing females that are incubating eggs. House Sparrows are also prolific breeders, able to raise up to four broods per season, with each brood averaging between four and five eggs. Nest-box monitors with House Sparrows find themselves dealing with a persistent and aggressive species that, left unchecked, can become a rapidly growing problem. So what is a nest-box monitor to do? There are many ways to discourage House Sparrows, and determining the best method is a personal decision. House Sparrows are nonnative, so the Federal Migratory Bird Act Treaty of 1918 does not prohibit trapping them or interfering with their breeding activities. Some monitors employ passive methods such as eliminating problem feeder stations and avoiding filler grain feed such as milo, millet, or cracked corn; placing boxes away from human-disturbed areas; placing monofilament line in front of a nest box; and plugging the entrance hole until a desired species arrives to breed. Other control methods involve removing House Sparrow nests, eggs, or both. However, House Sparrows are capable of rebuilding nests quickly, leaving some nest-box monitors feeling frustrated and defeated. Some monitors opt to trap sparrows that have taken over nest boxes. Some people advocate trapping and relocating House Sparrows, but this only creates a problem elsewhere. Another strategy is to stop providing nest boxes in areas with House Sparrows. Unless you are willing to discourage House Sparrows, putting up nest boxes may boost the numbers of a nonnative species that competes with native birds. Because House Sparrows are such fierce competitors and because they can multiply and spread quickly, it’s a common assumption that they are widely detrimental to populations of native cavity nesters. Although native birds often come out as the losers in competitive interactions with House Sparrows at nest boxes, scientific studies are lacking to show whether House Sparrows are causing widespread population declines of native songbirds. The Birdhouse Network (TBN) is gathering data about the types of competitors that cavity nesters encounter and the outcomes. Preliminary data from 2003 show that House Sparrows account for 54 percent of nest-box competitors, followed by wasps (17 percent), squirrels, mice, and European Starlings (4 percent each), bees (2 percent), other competitors (13 percent), and unknown (2 percent). TBN data show that in 92 percent of cases, nest-box monitors interfere to prevent House Sparrows from breeding. — Tina Phillips is project leader of The Birdhouse Network.